During a thunderstorm, it’s normally the lightning bolts that take over Instagram — after all, it’s a little difficult to apply the X-Pro II filter to a soundwave. That is, if you’re a heliophysicist armed with rockets, your own lightning bolt, and some heavy science. In a paper presented today at a meeting of the American Geophysical Union, Maher Dayeh from the Southwest Research Institute in San Antonio revealed detailed acoustic maps he’d made of a lightning bolt — an image of thunder, in other words. To get the data, Dayeh went to a U.S. military installation in Florida, and fired a rocket trailling a copper wire into a cloud during a thunderstorm. 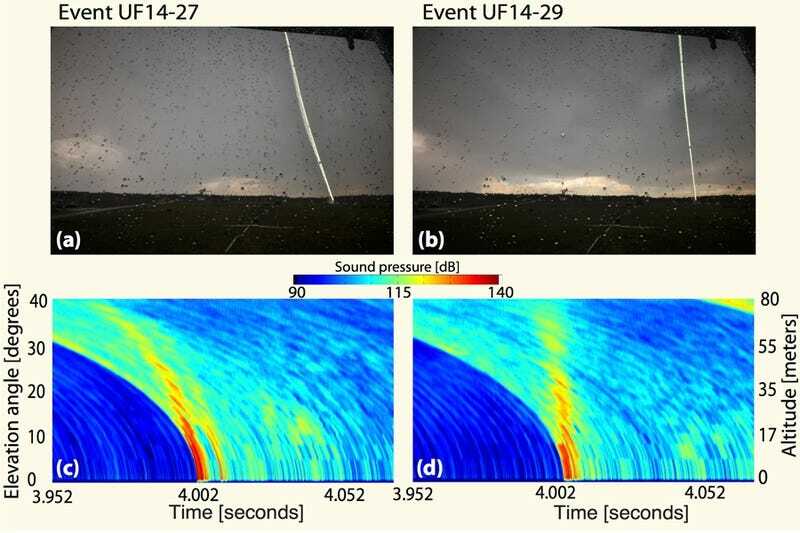 The rocket triggered a lightning bolt, which travelled down the wire, allowing the team to record the thunder with 15 microphones set a meter apart. That produced the acoustic maps you can see above.